Contact us on 0727788450, 0202178109 on info@asepsis-kenya.com, chat with us live or on whats-app for products related to balcony, yard, porch and even house gardens. We have a full range of edible and ornamental plants as well as all types of pots and planters. These range from herbs, vegetables, fruits and flowers. Some of the herbs we have include peppermint, spider mint, thyme, sage, rosemary. We have chilies and pepper too. You have access to fresh produce at all times without the need for refrigeration. You will save time on frequent visits to your grocery stores. Herbs, onions, tomatoes and chilies are used in small quantities but very frequently. For those who work late, this is a viable option. Many types of flowers that cascade trail or just grow upright such as geranium, petunia, callibrachoa, pansies, impatiens and poinsettia among others. 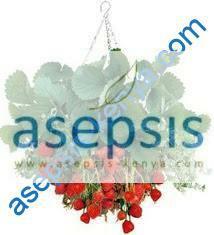 Please get in touch with Asepsis Limited for a full range of these products. 1. What herbs do you have? 2. Do you sell them as seeds, seedlings or already potted and at what prices? 3. Do you also have insect repellent plants? prices? 4. Do you you have fruit trees small enough for patios and balconies? 5. Do you have a show garden anywhere that someone can get ideas for balcony and patio gardening?